For other persons, see Eadred (given name). 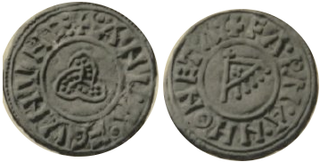 Eadred (also Edred) (923 – 23 November 955) was King of the English from 946 until his death. He was the son of Edward the Elder and his third wife Eadgifu of Kent, and a grandson of Alfred the Great. 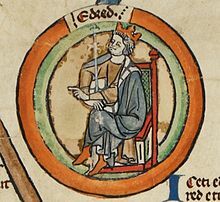 Eadred came to the throne following the assassination of his older brother, Edmund I. The chief achievement of his reign was to bring the Kingdom of Northumbria under total English control, which occurred with the defeat and expulsion of Eric Bloodaxe in 954. Eadred died at the age of 32 having never married, and was succeeded by his 15-year-old nephew, Eadwig. Eadred was a son of Edward the Elder by his third marriage, to Eadgifu, daughter of Sigehelm, ealdorman of Kent. He succeeded his elder brother King Edmund I (r. 939-946), who was stabbed to death at Pucklechurch (Gloucestershire), on St Augustine's Day, 26 May 946. The same year, on 16 August, Eadred was consecrated by Archbishop Oda of Canterbury at Kingston upon Thames (Surrey, now Greater London), where he appears to have received the submission of Welsh rulers and northern earls. The Anglo-Saxon Chronicle for the year 946 records that Eadred "reduced all the land of Northumbria to his control; and the Scots granted him oaths that they would do all that he wanted." Nevertheless, Eadred soon faced a number of political challenges to the West-Saxon hegemony in the north. Unfortunately, there are some notorious difficulties with the chronology of the events described in the historical sources, but it is clear that there were two Scandinavian princes who set themselves up as kings of Northumbria. 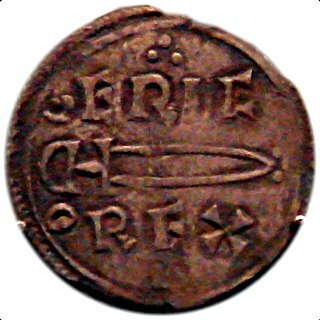 Óláf Sihtricson, otherwise known as Amlaíb Cuarán ('Sandal'), had been king of Northumbria in the early 940s when he became Edmund's godson and client king, but he was later driven out. He then succeeded his cousin as King of Dublin, but after a heavy defeat in battle in 947, he was once again forced to try his luck elsewhere. Shortly thereafter, Olaf was back in business, having regained the kingdom of York. What Eadred thought of the matter or how much sympathy he bore for his brother's godson can only be guessed at, but it seems that he at least tolerated Olaf's presence. In any event, Olaf was ousted from the kingship a second time by the Northumbrians, this time in favour of Eric son of Harald, according to MS E of the Chronicle. The other player in the game was Eric Bloodaxe, previously King of Norway from 930 to 934. After a number of successful operations elsewhere, he came to Northumbria and appears at some point to have set himself up as king. King Eadred responded harshly to the northern defectors by launching a destructive raid on Northumbria, which notably included burning the Ripon monastery founded by St. Wilfrid. Although his forces sustained heavy losses in the Battle of Castleford (as he returned home), Eadred managed to check his rival by promising the latter's supporters even greater havoc if they did not desert the foreign prince. The Northumbrians appeased the English king and paid compensation. The Historia Regum suggests that the threat of an independent Northumbrian king had come to an end in 952, when earls finally took over the helm. Towards the end of his life, Eadred suffered from a digestive malady which would prove fatal. 'Author B', the biographer and former apprentice of St Dunstan, described with vivid memory how the king sucked out the juices of his food, chewed on what was left and spat it out. Eadred died at the age of 32 on 23 November (St. Clement's Day), 955, at Frome (Somerset), and was buried in the Old Minster at Winchester. He died a bachelor, and was succeeded by Edmund's son Eadwig. ^ Anglo-Saxon Chronicle MSS D and E, translated by Michael J. Swanton, The Anglo-Saxon Chronicles. 2nd ed. London, 2000. ^ Anglo-Saxon Chronicle MSS A, D and E, 955, MSS B and C, 956. Anglo-Saxon Chronicles. Edition available online. Historia Regum, ed. T. Arnold, Symeonis Monachi Opera Omnia. 2 vols: 2. London, 1885. John of Worcester, Chronicon ex Chronicis, ed. Benjamin Thorpe, Florentii Wigorniensis monachi chronicon ex chronicis. 2 vols: vol 1. London, 1848-9. Sawyer no. 1515 (AD 951 x 955). Text available from Anglo-Saxons.net. Like his grandfather King Alfred, Eadred left a written record of his will. Anglo-Saxon Charters, Sawyer nos. 515–580 (including S 552a, 522a, 517a-b), 1211-2, 1511. Secondary sources Williams, Ann (2004). "Eadred (d. 955)". Oxford Dictionary of National Biography. Chronicle of Æthelweard, ed. and tr. Alistair Campbell, The Chronicle of Æthelweard. London, 1961. Vita S. Dunstani ('Life of St. Dunstan'), ed. W. Stubbs, Memorials of St Dunstan, Archbishop of Canterbury. Rolls Series. London, 1874. 3-52. Available as PDF from Google Books (or from the Internet Archive here or here) and from Gallica. Vita S. Æthelwoldi ('Life of St. Æthelwold'), ed. and tr. Michael Lapidge and Michael Winterbottom, Wulfstan of Winchester. The Life of St Æthelwold. OMT. Oxford, 1991. Gough, Harold. "Eadred's Charter of AD 949 and the Extent of the Monastic Estate of Reculver, Kent." St Dunstan: His Life, Times and Cult, ed. Nigel Ramsay and Margaret Sparks. Woodbridge and Rochester, NY: Boydell, 1992. 89-10. Keynes, Simon (1994). "The 'Dunstan B' Charters". Anglo-Saxon England. 23: 165–93. doi:10.1017/s026367510000452x. Sawyer, P. "The last Scandinavian rulers of York." Northern History 31 (1995): 39-44. Stafford, Pauline (1989). Unification and Conquest. A Political and Social History of England in the Tenth and Eleventh Centuries. London. Stenton, Frank Merry. Anglo-Saxon England. 3d ed. Oxford, 1971. 360-3. Wikimedia Commons has media related to Eadred. Dunstan was successively Abbot of Glastonbury Abbey, Bishop of Worcester, Bishop of London, and Archbishop of Canterbury, later canonised as a saint. His work restored monastic life in England and reformed the English Church. His 11th-century biographer, Osbern, himself an artist and scribe, states that Dunstan was skilled in "making a picture and forming letters", as were other clergy of his age who reached senior rank. Edmund I was King of the English from 939 until his death. His epithets include the Elder, the Deed-doer, the Just, and the Magnificent. Eadwig, also spelled Edwy, sometimes called the All-Fair, was King of England from 955 until his premature death. Edgar, known as the Peaceful or the Peaceable, was King of England from 959 until his death. He was the younger son of Edmund I and Ælfgifu of Shaftesbury, and came to the throne as a teenager, following the death of his older brother Eadwig. As king, Edgar further consolidated the political unity achieved by his predecessors, with his reign being noted for its relative stability. His most trusted advisor was Dunstan, whom he recalled from exile and made Archbishop of Canterbury. The pinnacle of Edgar's reign was his coronation at Bath in 973, which was organised by Dunstan and forms the basis for the current coronation ceremony. After his death he was succeeded by his son Edward, although the succession was disputed. Eric Haraldsson, nicknamed Eric Bloodaxe, was a 10th-century Norwegian ruler. It is widely speculated that he had short-lived terms as King of Norway and twice as King of Northumbria. Ida is the first known king of the Anglian kingdom of Bernicia, which he ruled from around 547 until his death in 559. Little is known of his life or reign, but he was regarded as the founder of a line from which later Anglo-Saxon kings in this part of northern England and southern Scotland claimed descent. His descendants overcame Brittonic resistance and ultimately founded the powerful kingdom of Northumbria. Eadgifu of Kent was the third wife of Edward the Elder, King of the English. John of Worcester was an English monk and chronicler who worked at Worcester Priory. He is usually held to be the author of the Chronicon ex chronicis. Ragnall Guthfrithson was a Viking leader who ruled Viking Northumbria in the 10th century. He was the son of Gofraid ua Ímair and great-grandson of Ímar, making him one of the Uí Ímair. He ruled Northumbria in 943 and 944, either with, or in opposition to, Olaf Cuaran. Ragnall and Olaf were driven out of Northumbria by the English in 944. His later life is unknown but it is possible he was the "king of the Danes" who is reported as being killed by the Saxons at York in 944 or 945.